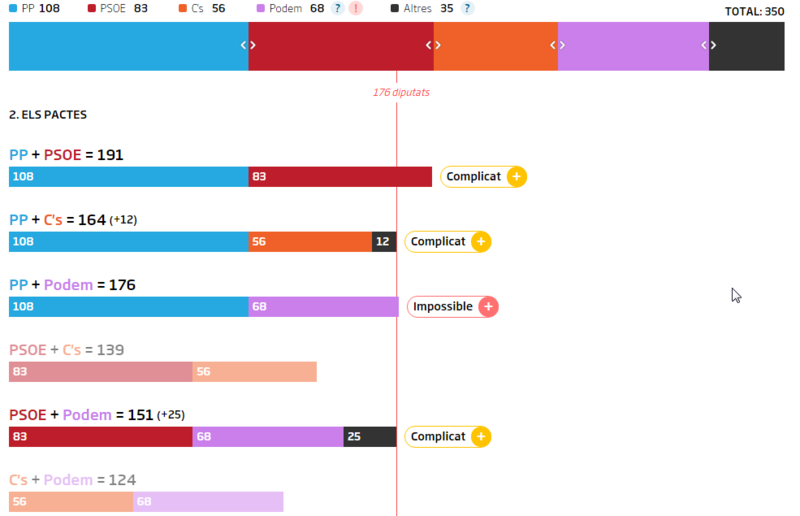 Using the very handy ‘Pactometre‘ on Catalan newspaper Ara’s website, combined with the latest polling data (from Andorra’s El Periòdic, cunningly disguised on this Spanish site as a music survey, also now available as a second poll on the Andorra site), I’m increasingly convinced that there will need to be new elections. Unless the polling data is way off (which I fully accept it could be), there is little chance that anyone will be able to form a government and get a president elected by the Congreso. (This is just one of the scenarios I’ve tried. Each scenario within the bounds of El Periòdic’s polling – PP low/high, etc. – leads to likely new elections). Maybe Catalonia led the way again? What’s your prediction for Spain’s elections?